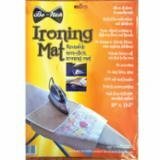 BoNash ironing Mat 13.5" x 10" non stick ironing mat that protects fabric from shine, scorch, or burn. Iron over motifs and transfers without damage. Great for needlework, embroidery, and taking to class.